I was so excited when The Night Circus dropped through my letterbox. This review at Top Floor Corner was the first of many that intrigued me. This is the fifth book that I read for the Pay It Sideways Challenge. I know you shouldn’t judge a book by its cover, but there’s something about this simple yet elegant front cover that made me want to start The Night Circus immediately. And it turned out to be the perfect book to read as autumn approached. The Night Circus is everything that I had been promised. It’s enchanting, bewitching and all sorts of other magical words. The book is long and detailed enough for the reader to fully lose themselves in the world of the circus and the main characters. In fact, I could quite happily have carried on reading forever… or even better, ran off and joined the circus! The concept of Le Cirque des Reves is first discussed at one of Chandresh Christophe Lefèvre’s midnight dinners. However, the circus ends up being so much more than any of the guests realise. As time goes on it becomes apparent that there is more going on than just tricks and illusion. There is a strange magic keeping the circus alive. The Night Circus is packed with wonderful characters who are each in their own way important to Le Cirque des Reves. Celia and Marco are the glue holding everything together, but not necessarily the most interesting characters. Special and devoted friends of the circus such as Bailey and the legendary clockmaker Freidrick bring a nice touch to the book. They are just normal people who happen to get wrapped up by certain events. My very favourite characters are the red headed Murray twins. Widget and Poppet, born just before and just after midnight on the opening night of the circus, their fates are linked just as closely to it as Celia and Marco. With their own strange and magical talents and fun-loving attitudes, I would not want anyone else to be my guide in their fascinating home. The storyline flows beautifully through the pages, smoothly taking us between different years and different places, unravelling at the perfect pace, allowing us to savour every moment. There are several strands to the story but the circus is always at the heart – everything is bound to The Night Circus in one way or another. I look forward to seeing more from this author. She has created a world that feels so real, You can almost smell the caramel and feel the autumn crispness of the evening air. The idea of The Night Circus is so full of imagination and magic, I would love to spend an evening walking around and discovering the wonders inside each tent. If you want to escape the boring reality of everyday life for a while, I strongly recommend a trip to The Night Circus. Click on the link below! I’m glad you liked it. It’s always a worry when you really like a book, because you want everyone else to enjoy it too! Ooooh! I’ve got this book on my shelf and I’ve wanted to read it for ages, but I just never seem to get round to it, it’s very annoying! You should definitely try and find time to read it the autumn/winter, while it’s cold outside! It’s the perfect sort of weather for The Night Circus! Great review. It’s been recommended to me by loads of people. I’m really looking forward to reading it. 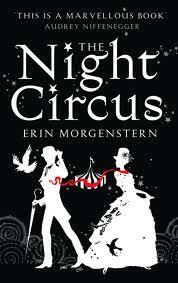 I’ve not read many bad reviews about The Night Circus, so I hope you will enjoy it too! Let me know what you think! I had a few small issues with the storyline itself, but the imagery was MAGNIFIQUE (I have no idea if I spelled that correctly). I could have read an entire book JUST about the circus. I know what you mean. I wasn’t too bothered about the love story between Celia and Marco and didn’t really care whether that ended well or not – so long as the circus was OK! I loved The Night Circus. I had heard great things, but was reluctant to read it when I realized it was about magic. However, I’m thrilled I did since it’s right up there with The Snow Child as my favorite book of the year. Enchanting, but very believable. Loved the twins! Also, I loved The Snow Child too! Funny, I too couldn’t get through JS&MN and that was the source of my initial hesitation when I first opened this one. But I got sucked in pretty quickly. And, yes, it has made me wonder if I should try JS&MN again. I think it’s the time period combined with the magic that invites the comparison, but actually the writing style is very different. It’s definitely a brilliant autumn read, especially if you like a bit of magic!